The perfect shoes for the perfect dress? I think so. The Georgio Wedge by RMK Shoes were my only choice to pair with my Camilla and Marc Revival Dress. The beautiful peacock suede really helps make the jewel tone colours of the botanical print just pop, not to mention how well they elongate my short little legs. Despite these wedges been dangerously high, they are so easy to walk around in thanks to that handy little platform at the front. I have rocked this combo several times of the last couple of weeks, and I think this outfit has many wears still to come. I suspect the residents of Springfield think biomass is a dead issue, but we-- Stop Toxic Incineration in Springfield-- continue to take whatever steps necessary to keep Palmer Renewable Energy from constructing s biomass incinerator in Springfield. We're appealing the Dept. of Environmental Protection's air permit (along with the Toxics Action Center and the Conservation Law Foundation) and preparing a defense in Land Court as a result of the Zoning Board removing the building permit issued to PRE. But always, in the back of our minds, we've been waiting for the Dept. of Energy Resources to release its new regulations about biomass, and whether the plants proposed in Greenfield, Russell and Springfield will be eligible for the state's subsidy program, the Renewable Energy Credits. Well, finally! Here's a summary: http://www.mass.gov/eea/docs/doer/renewables/biomass/summary-of-rps-proposed-final-regulation.pdf. DOER is going to require 50% efficiency to be eligible for RECs, while the proposed plants are struggling to reach even 25% efficiency-- just one of the reasons we oppose these plants. Keep in mind, however, that Palmer Renewable Energy has said that it doesn't need RECs to operate profitably-- although I'm sure PRE wouldn't turn down the money if eligible. So we can't let our guard down. The state Department of Energy Resources on Friday released revisions to its regulations for how Renewable Portfolio Standards would apply to biomass generating plants. June by the state Legislature’s Joint Committee on Telecommunications,Utilities, and Energy. The proposal would apply to pending projects, including a 47-megawatt wood-fired plant planned for Greenfield by Madera Energy Inc. of Cambridge. His plant would be built in the I-91 Industrial Park. Madera Principal Matthew Wolfe declined to comment on the latest proposal Friday, saying he was a “just sifting through” the new document. The project, he said, has been in limbo for two years pending the new rules, which set the standards for projects that are eligible for receiving green energy tax credits to help make them economically feasible. “We’re waiting on a resolution to these regs,” said Wolfe, pointing to a public comment period that extends to June 18.
generating plants release more heat-trapping carbon dioxide into the atmosphere per unit of energy than oil, coal, or natural gas — and that the greenhouse gases take a long time for forests to absorb. eligible for one-half renewable energy credit per megawatt-hour, — slightly better than a stateof- the-art coal-fired power plant. They allow one credit per megawatt-hour for generators achieving 60 percent efficiency and include harvesting standards designed to protect forest soils. Facilities must also have 20-year lifecycle and carbon dioxide emissions that are no greater than 50 percent the emissions from a natural gas facility. terrible public policy to reward biomass with the public’s money at 50 percent efficiency. A wood stove does better than that. Energy efficiency costs a third as much as biomass for electricity. We should put our money where it will do the most good. “We will be reviewing the regulations carefully and commenting during the 30 day comment period. All written comments on this proposed final regulation should be submitted electronically in PDF format by June 18 at 5 p.m. to doer.biomass@state.ma.us. The state expects to have afinal regulation in place this summer. With the unification of Germany under the leadership of Prussia, Bismark set upon a policy of reducing the influence of Catholicism in Germany. The policy, known as Kulturkampf, aimed to set about to place deliberate obstacles in the path of German Catholicism through institutionalised prejudice.. Whether one agrees with his policy or not, the following graphs would seem to suggest that it may have been responsible for Germany's calamities during the 20th Century. It's hard to speculate as to what the current Germany would have been like if Adolf Hitler had not come to power. WW2 was a disaster for Germany on so many levels. It's doubtful that Germany would have engaged in a world war if Hitler had not come to power and therefore the forces which gave rise to him are of significant interest. Germany was not committed to militarism, even after years of suffering under the injustice of the Versailles Treaty, but the treaty itself, and the Depression provided an environment in which radicalism could thrive. This next series shows the development of the Nazi vote from 1924-1934 within the background of the social forces previously mentioned. 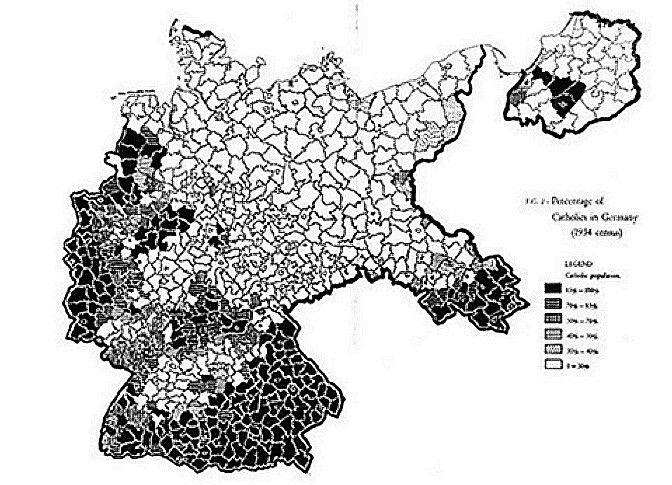 Firstly, a graphic showing the distribution of German Catholics vs Protestants int the 1934 Census. The darker the area, the more Catholics. That's pretty impressive. Whilst the Nazi party did make inroads into Catholic Germany, its power base was Protestant. Anywhere between 30-50% of Protestants voted for the Nazi's. So who did else did they vote for? The Centrist party represented the Catholic political force. They certainly did not get their vote. Here's the religious map again. The Protestant vote was split between the powerful anti-traditional forces of Socialism and Fascism with a smattering of Communism. Way to go Team Luther!! In fact, the Protestant vote for the Nazi's was greater in the July 1934 election, but it appears that they started to get a little scared of Hitler and when the November vote came, directed approx two million votes away from the Nazi's to the Socialists and Communists! Only 10-20% of Protestants seemed to reject the new radicalism and directed their vote to the German National Peoples Party. This party was comprised of the deep social conservatives of Protestantism and it attracted about 10% of the vote up North. It's party members were initially sympathetic to the Nazi's but after a while saw that they were completely nutty and crossed over to support the Catholics against Hitler! The graphs were obtained from this site. I was quite surprised at the electoral maps that I published in my previous post. I was able to find another one which illustrates the voting patterns more clearly. I'm sorry for the small size but I could not find a bigger version of it. Now, the illustration breaks down the pre-WW2 map of Germany into electorates. The redder the electorate the more support the Nazi's had in it. Green areas are areas where Nazi's were unable to win seats. Now the taller the individual electorate, the higher the proportion of Catholics in it. Flatter areas are Protestant dominant. Now, it's pretty obvious that Catholic areas tended to vote strongly against Hitler, whilst the Protestants tended to vote for him. Note, this does not mean all Protestants voted for him,[paging Wilhelm Ropke] just the majority of them. Likewise, the majority of Catholics voted against Hitler; not all of them. "There is this myth that formerly Catholic countries are somehow more immune to liberalism than those that were Protestant." Catholic countries aren’t immune to liberalism, it’s just that when they succumb to liberalism it assumes a different form to that of Protestantism. When Catholics go liberal, their liberalism is much more openly hostile, there’s no “niceness” about it at all. It tends to be an all or nothing phenomenon with Catholics. The largest communist parties in Europe were not in the Anglosphere, rather in Italy and France. As mentioned previously, I've just discovered Erik Ritter von Keunhelt-Leddihn and whilst reading through his book, The Menace of the Herd, I found this passage which I felt "synched" quite nicely with the above passage. This is also no doubt the reason why socialism and the more violent forms of ochlocracy and superdemocracy — Fascism — have to blaze their trails into the Catholic world by revolts, revolutions, and assassinations. The deep antagonism between "backward" Catholicism and these new "progressive" philosophies make a compromise impossible. This can be easily illustrated and demonstrated by the manifold examples of revolutionary socialism in Spain and Portugal, from the socalled "Communists" of Andalusia and Catalonia in 1835 to the FAI, CGT, UGT, and POUM, the revolutionary socialism of Italy which reached its zenith in 1921, the revolutionary social democracy of Vienna with its two risings in 1927 and 1934, the sanguinary revolutions in Budapest (1919), in Munich (1919 and 1923), Paris (1792, 1830, 1848, 1871, 1934), and Baden (1848). We also find strongly revolutionary forms of socialism in the domains of the Eastern Church (Russia, Rumania, Bulgaria, Greek Macedonia, and Thrace) as well as in Catholic Poland and Lithuania. In the Protestant countries on the other side we find socialism usually tame, bourgeois, and parlor pinkish. Only Berlin and Hamburg knew, apart from the central German industrial area, the meaning of revolutionary socialism, whereas the tributary parties of the II International in Great Britain, the Netherlands, Norway, Sweden, Denmark, Latvia, the United States, and Canada were all imbued by a nice sedentary bourgeois spirit. In Catholic Mexico on the other hand we see socialism closely connected with violence and terror. Now, from what I've read of Von Keunhelt-Leddihn he does seem to overplay the pro-Catholic anti-Protestant thing. His analysis doesn't really account for the fact that, the U.S., a culturally Protestant nation, was the perhaps the most staunchly anti-communist nation of them all, still I think his analysis has some validity. It's my contention that Protestantism's weakness is it's legitimisation of the Rationalisation Hamster, and it is this what makes "compromise" with the devil possible. However, the more scriptural a Protestant is, then it's much much harder to make the compromise. This would explain why the Anglicans are lefty while the Baptists push more to the right. Quite a bit of bad news from the House of Representatives yesterday for poor families....and a little good news...will write more later. Meanwhile, seniors shut down the State House yesterday! One senior did say, "Shouldn't we have spent our time lobbying?" But hey, Been There, Done That! (and will do again, most likely.) So when will POOR PEOPLE shut down the State House? STATE HOUSE, BOSTON, APRIL 24, 2012…..Senior citizens frustrated with theLegislature's handling of transportation and other public policy issues disrupted House budget deliberations Tuesday, prompting House leaders to declare a recess and instruct court officers to clear thepublic galleryof protesters. "We got kicked out. I've never been kicked out of anyplace," Cathy Laroche, 70, of Fall River told the News Service while standing outside the gallery with her sisters, Ruth Grant, 76, and Claire Karl, 75. The protest began shortly after 3 p.m. with House Speaker Robert DeLeo presiding. As protesters began to express themselves, Rep. Paul Donato(D-Medford) took the gavel and asked them “respectfully” to quiet down. When they didn’t, Donato quickly declared a recess, after which courtofficers swarmed the gallery, shouting at the protesters, including some in wheelchairs, and directing them to the exits. primarily unfolded behind closed doors. The protest, involving about 200 seniors, transit rider advocates and their supporters, occurred as lawmakers milled about the chamber waitingto begin afternoon deliberations on transportation amendments to the$32.3 billion state budget proposal. “It’s an emergency situation for people with disabilities and seniors because they’re facing fare hikes that could endanger their living situation,” said John Robinson, a Somerville resident and member o fSenior Action Council. Robinson said seniors and disabled residents might be forced to choose between paying for rides to work or their medical appointments and putting food on their table. 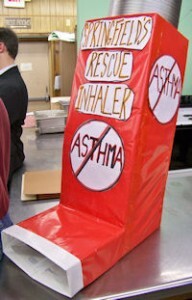 Protesters were equipped with a list of budget priorities assembled by the council. The priorities include investing in public transportation and blocking planned service reductions, ending the waiting list for homecare services, restoring a program intended to help seniors pay forprescription drugs, and raising revenues and taxes. The House budget, unlike the spending plan unveiled in January by Gov.Deval Patrick, includes no new taxes or fees, with House leaders sayingtheir approach is aimed at keeping down tax burdens as Massachusetts looks to accelerate its economic recovery. Other council priorities include ensuring that a personal needs allowance for nursing home residents is maintained at $72.80 per month, reinstatinga policy that allows MassHealth nursing home residents to keep their beds if they leave for a hospital stay, increasing supports for councils onaging to help those organizations cope with an increasing elderly population. About 15 minutes after it began, the protest subsided and seniors began filing out of the State House. Some visitors criticized their tactics as“disorganized” and said they would have been better off taking theirmessage to reporters. “They have to learn how to hit the media, but itdoesn’t just mean disorganization,” complained Mary Crozier, an elderly Boston resident who ripped the prosters’ tactics. But Tuesday’s protest underscores the fact that many in Massachusetts disagree. The protest is largely an outgrowth of a decision by the MBTA earlier this month to embrace a budget-balancing plan that asks disabled riders to, in some cases double the amount they pay for the T’s RIDE service.The board of the MBTA, facing a projected $160 million budget shortfall in the upcoming fiscal year, backed a plan that would raise subway and bus fares, impose modest service cuts and eliminate a subsidy on ferryriders. The cuts could go deeper, T officials have warned, if theLegislature doesn’t back the agency’s plan to draw $51 million from a motor vehicle trust fund surplus. Last night the hubs and I took our monthly trip down to the good ol U. S. of A. Man I love that place. I bought FOUR containers of fat-free feta cheese. Four BIG containers. Why? Because a) we don't have fat-free feta up here, and b)what costs me $10 in Canadaland costs $2.50 in Americaland. Blows me away. I will never buy feta in Canada again. Ever. I also scored some suuuuper cheap 2 buck chuck wine from Trader Joe's. It's not the best in the world, but it's tasty enough for "wine o'clock" emergencies. And again, considering most wine in BC starts at $10 a bottle, you can't beat a 75% savings! Other things my American friends should be thankful for? Cheese in general (we buy cheddar and parm down there at again, 75% less), milk (50% less), tzatziki (75% less), chicken (50% less) and butter (60% less). And did I mention the discount stores! TJMaxx, Ross, Marshalls, etc etc. I want to be a little angry and jealous inside, but I must say that not having them here makes it a huge treat when we do get to visit them in down there. Now onto the real reason of this post. I have a minor light fixture obsession. At the designer warehouse sale I attended last fall (still have to do a post on that sale!) I came home with 4 fixtures, 2 shades and 3 table lamps. For a small townhouse, that's a lot of light. Since moving in, we have added a pendant above the sink, a chandelier above the dining room, changed out 1 flush mount, and added chandeliers in all 3 bedrooms. The only place without a real fixture to call it's own is our small entry way. So when I saw this baby at TJ's my heart started pumping real fast. OH. EM. GEE. Ain't she beautiful? I don't even know what it's called, but I'll call it a chrome pentagon pendant (although it looks to have more sides than that) or maybe a honeycomb? Any ideas let me know! Anyways, I fell in love with her the instant I saw her. And when I looked at her price tag I loved her more. $38.99. The "compare at" price was $499. EEEEKS!!! How could I say no? I tried to stuff it in my cart, but it was already overloaded with other things. I put it back down. And I thought long and hard. And then I walked away. Well, first I had to show the hubby what I was walking away from so he would be proud, and then I walked away. How could I? Well, I did self impose a spending restriction this month. My Already Own April is supposed to help tame the spender in me, and cultivate the user of things already owned in me. Plus, it was pretty big. And it had a really long bar (so it would hang really really low) which might have been able to be cut down to make it a flush mount, but I didn't want to take the chance. Also, the fact that it was so steeply marked down made me worry it might not work. And we don't have a TJMaxx around the corner to return it to, so big potential hassle. Should I have just gone for it? I'm starting to regret not buying it. If you live near Bellingham, Washington, hop in your car right now and go buy it! She deserves a good home. 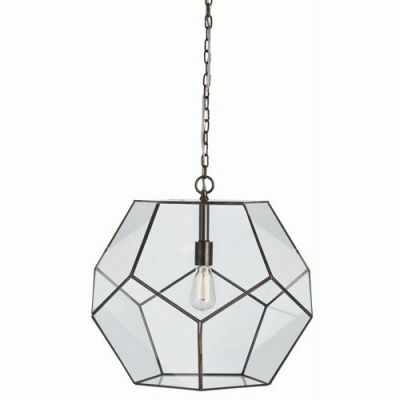 Here's a fixture I found online that looks VERY similar. Super cute, right? You can buy it here for $1040. YIKESABEE! Now I'm really wishing I had bought it. Another thing we walked away from? This adorable shirt. We are a touch obsessed with our wiener dog, so it was a big deal not to buy this. But it was too small for hubby and too large for me, so at TJ's it stayed. I am slowly starting to realize I don't need to buy EVERYTHING that has a wiener on it. Although I really want to. Anything big you've walked away from and regretted? And am I certifiably insane for leaving that pendant behind? I was surfing the manosphere yesterday, when over at Vox's place I noted this comment by "artie" in response to Vox's post, "Democracy vs Aristocracy". It will be interesting to see how long this farce will go on. I also on the sceptical side. The EUcrats always have the righist hammer to throw down to the people. It has been the most effective political weapon in Europe since the end of WWII. That's why I think the work of Kuenehlt-Leddihn is so important....and ignored. Now, I've never heard of Kuenehlt-Leddihn before and I thought I would read up on him. He appears to one of those freaky bastards* that the educational system of the old Hapsburg empire seemed to produce. The last of the great renaissance men and a man who also liked to thump some of themes pushed by this blog. Anyway, he wrote a rather influential book in the 40's, The Menace of the Herd. 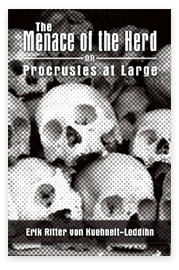 It's available, from the Mises Institute, as a pdf here. It seems that whilst Hitler was a bad Catholic, all those nice Protestants really liked him........ a lot. Much more than his fellow Catholics actually. No seriously, I mean, WTF? It is time to get off this “liberalism is the result of Calvinism/Christianity/Nominalism/whatever” nonsense. Now, this is not a dig at Thursday but rather a spectacular demonstration of the opposite. I'm sorry but religion matters. Big time. Kuenehlt-Leddihn was no fan of Protestantism, but he did recognise that sound Protestantism would have probably prevented the rise of Hitler. It's the watered down version of it that is toxic. And by the way, Kuenehlt-Leddihn correctly diagnosed Nazism as a leftist phenomenon.